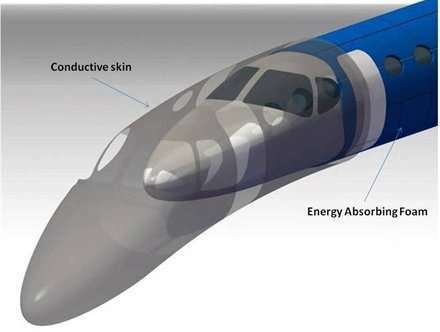 (PhysOrg.com) -- Despite the popular perceptions of plane travel, it is a relatively safe way to travel, and the folks over NASA are hoping to make it even safer. They have awarded four different research teams a total of $16.5 million to work on safer and more fuel efficient planes. They may even be quieter than the standard planes. One of the most interesting projects in the works is being done on a Cessna. 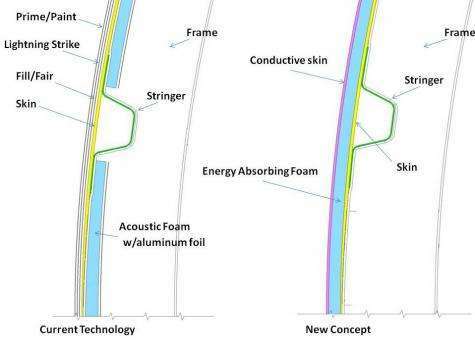 The Cessna in question would have a self-healing skin, which will allow the plane to protect itself from lightning, extreme temperatures, impact, and electromagnetic damage. No real detail on the skins self healing has been given at this time. The skin, which some have already begun to dub a "magic skin", is going to be applied by a team from GE and Cessna. The idea came from an N+3 report, which is supposed to look three generations beyond the current planes in the air. In the report, the skin is made of a conductive film, paired with an energy absorbing foam, which would coat the whole of the aircraft. If these new skins come to the current generation of planes, they could potentially reduce the weight of the existing environmental countermeasures by half, which would make the plane a lot greener than it is now. Considering that the plane is one of the most polluting ways to travel on the planet, this would be a significant improvement. The skin will actually visually show damage to help inspectors do their jobs better. This technology is not expected to be on commercial planes for another 20 to 25 years. So, do not hold you breath for one of these planes. Did that illustration REALLY have to look like a condom being put on? This might your imagination. I don't see it. an energy absorbing foam, which would coat the whole of the aircraft. Will this offer protection against terrorist beam weapons I wonder? Can we have less of the tabloid journalistic cliches like "the folks over NASA". I though Physorg was a science site . Why, do you have a windscreen on your cockpit? I call b/s. Magic doesn't exist and neither does this skin product. Even if it did it would add to much weight and or drag to be useful. Now the Air Marshall will be able to discharge his firearm without taking down the aircraft.